5/5 As a tennis coach at Pathways, the Infrastructure the school provides is best in my field. As an employee, we are well taken care of with some wonderful benefits, adequate pay, vacations etc. There is just lack of residing facility on campus for staff those are coming from a long distance, which is a bit of a problem. 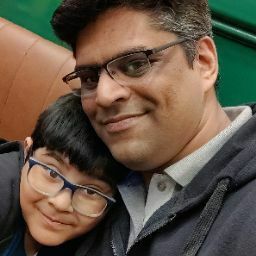 1/5 Our son joined Pathways after we moved to Gurgaon from Dubai. The school has spiraled downwards after the senior school principal left two years back. Many other teachers with no experience delivering the IB curriculum have replaced some of the wonderful teachers that left. It had not been a present experience for us and our son, thankfully it ended when we moved back to Dubai. Pathways School, Gurgaon-Faridabad Road is a school in Gurgaon offering International Baccalaureate: PYP (006381), International Baccalaureate: MYP (006381), CIE: IGCSE and International Baccalaureate: DP (006381) for Pre-Nursery, Nursery, Kindergarden, Primary School, Middle School and High School level students. The school was founded in 2010 as a Private Co-Educational school. The school is located Gurgaon-Faridabad Road. Jeet and 13 other people have rated this school. This school was last reviewed on 28 Aug 2017 and first reviewed on 8 Dec 2012 at SchoolWiser. The overall experience with Pathways School, Gurgaon-Faridabad Road based on the ratings left by users so far seems to be good but the sample size of the ratings is insignificant. This school seems to perform exceptionally well at Campus parameter. It also performs well on Classrooms, Sports & Transport. Though parents may seem to have some reservation over Overall Cost. Checkout detailed ratings and reviews below for reference but do exercise your best judgement. Pathways School derives its name from Harvard University’s Dr Howard Gardner’s “multiple pathways.” They indicate the multiple approaches to use the different intelligences of children. The founders Pramod K Jain along with his three sons with a vision to make a mark into the field of education came in with this model which is scalable and sustainable. Location wise, the Pathways School Gurgaon (also known as Pathways Gurgaon) is located strategically with ease of access from Gurgaon, Faridabad and Delhi and is a day school . The child needs to be minimum 2.5 Years as on 31 March 2019 to be eligible for Pre-Nursery admission. School Admission applications can be made Online on the school website. New academic session for the school starts from July for IB and July for CIE. You can find further details below for reference on admission eligibility and application for Pre-Nursery and Higher Grades in the section below, but we strongly recommend that you check the school website for most accurate and up-to-date information. 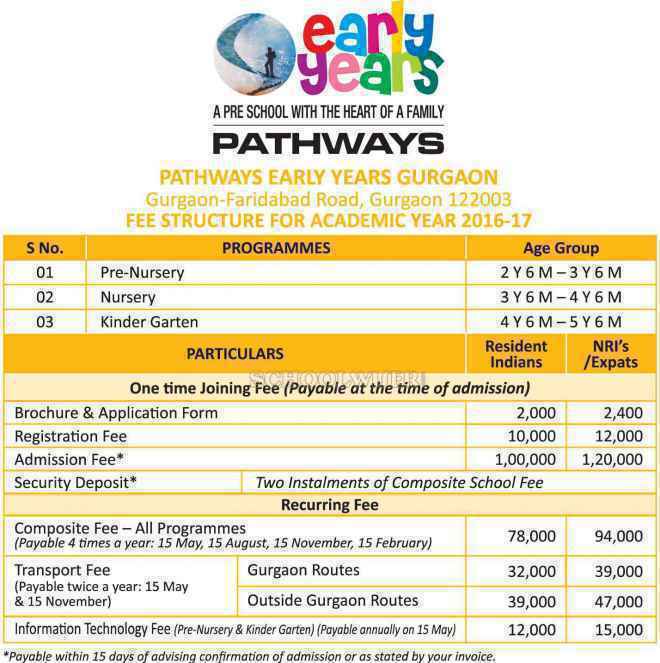 A detailed fee structure & complete breakup for Pathways School, Gurgaon-Faridabad Road is provided below for reference. The objective of the fees details below is to provide an economic reference point for parents to understand approximate expense for this school and evaluate affordability based on their current circumstances and for the long term. For parents admitting their children in admission session 2018-2019 at The school the total school fees for the first year including all admission related charges for Pre-Nursery but excluding transport fees shall be around Rs.7,01,000. This includes total One-Time Admission related Charges including Refundable Security of Rs.3,19,000. For parents continuing in the school from previous years, the effective annual fees is around Rs.5,17,000 i.e. approx. Rs.43,083 per month or Rs.1,29,250 per quarter without transport fees. The school observed an overall fee increase of approximately 16% from the 2016-2017 session. The mean average annual fees (without admission & transport fees) of all school in Gurgaon whose fee details are available on SchoolWiser is Rs.1,19,575. The average mean is Rs.2,78,238 and Rs.2,68,771 for IB - DP & CIE - IGCSE schools respectively among these. SchoolWiser is usually one of the first places to look for breaking news on schools. Pathways School, Gurgaon-Faridabad Road was most recently in the news for Schoolboys startup in UN top 50 list. Get all the latest news and updates at SchoolWiser. Below we have aggregated relevant recent, ongoing & past news articles from leading publications such as TNN, Zee News, India Today and Merinews. The schools news links shall take you to originally published articles on external news sites.